Chicken enchiladas are my absolute favorite version and these are no exception. Corn tortillas filled with a mixture of shredded chicken, onion and roasted green chiles and topped with green enchilada sauce and Monterey Jack cheese are a sure fire hit at my house. 2 poblano chiles, roasted and chopped. You can also use one or two cans of the diced green chiles. Heat your oven to 375 degrees. Place chicken on a baking sheet, drizzle with olive oil and sprinkle with salt and pepper to taste. Cook for 25-30 minutes or until chicken has reached 165 degrees. Set aside to cool enough to shred. In sauce pan wide enough for tortillas to fit in heat enchilada sauce and half and half over medium low heat until warm. Ladle a thin layer of sauce into 2 9 x 13 baking dishes. In another skillet heat about a tablespoon of olive oil and cook the onions and garlic until translucent. Add the shredded chicken and chopped chiles. Heat through and add 3/4 cup of cheese. Warm tortilla in enchilada sauce until pliable. Fill with a spoonful of chicken mixture, roll and place seam side down in baking dish. Repeat until all filling and tortillas are use. 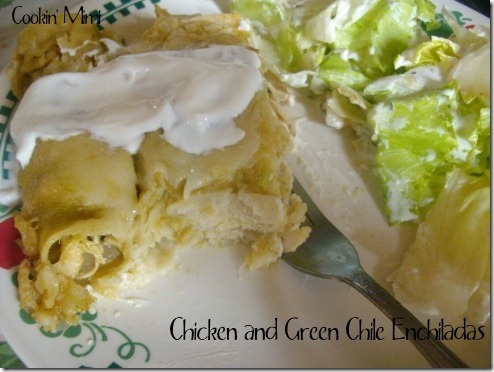 Pour remaining sauce over enchiladas and sprinkle with remaining 1 1/4 cups of cheese. Bake at 375 for 20-30 minutes or until bubbly and cheese starts to brown. Let rest for ten minutes before serving. Linked to Tasty Tuesday, Delicious Dishes at It’s a Blog Party, What’s on Your Plate? Oh! WOW! This looks tremendous – like the chicken baked instead of boiled. Will definitely be making this over the weekend!!! Thanks for another great recipe! Thanks! I bake or saute my chicken for almost everything even most soups. It really does make a difference in the taste Chicken and dumplings are the only thing I can think of that I still poach the chicken for.